Everyone’s favorite edgy model meets everyone’s favorite red carpet superstar. Cara Delevingne and Jennifer Lawrence are both modern fashion icons. Both women are known for their killer careers and for being designer darlings. That said, their styles have little in common. What is going to happen when Jen’s bold, classy looks mesh with Cara’s laid back, rocker-chick vibe? I’ve put together three outfits with these two in mind. 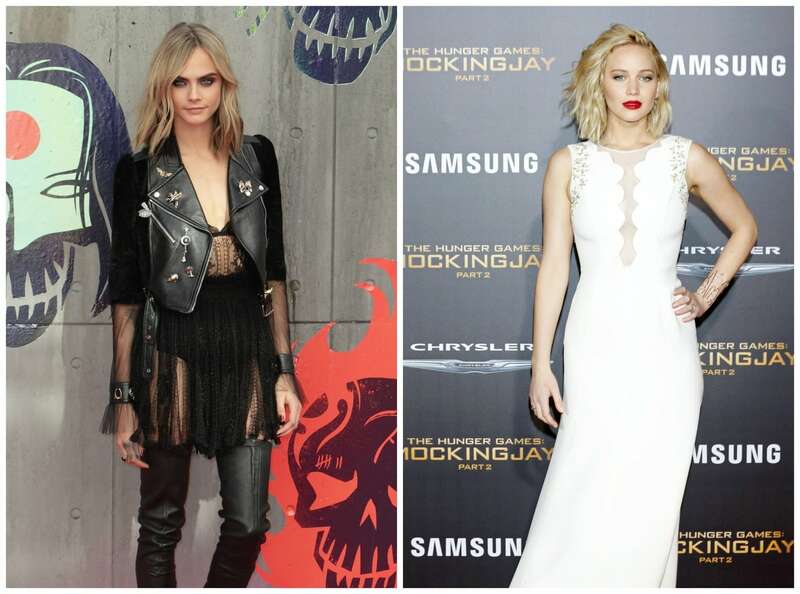 Cara’s edgy rocker vibe and Jen’s structured red carpet look combine to create something special. These two looks have little in common – but they do both include sheer panels. I started there, with this dress in a similar shape to Cara’s. The red lips and structured white blazer are inspired by Jen’s look, while the pin is a nod to Cara’s pins – and her love of junk food! Finish the look with over-the-knee boots and a fringey clutch à la Ms. Delevingne, and a cool zig-zag bracelet that’s a nod to J.Law’s. This would be a fabulous look for a fun night out next Halloweekend! Cara’s eclectic look is so downtown chic. Mix it up with Jen’s classy ensemble and what do you get….? 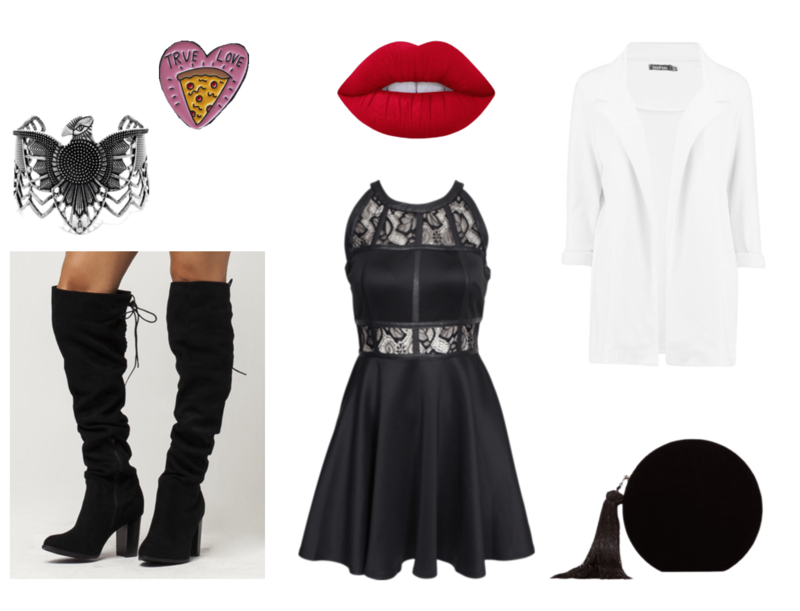 Now let’s talk extras: A purple lip and studded boots will give you all the Cara-styler confidence you need! Finally, the classic backpack is polished and pretty like Jen. Now for a big hit of contrast: Super laid-back streetwear meets quirky Met Gala glam. To me, this is the most unique outfit of the three. 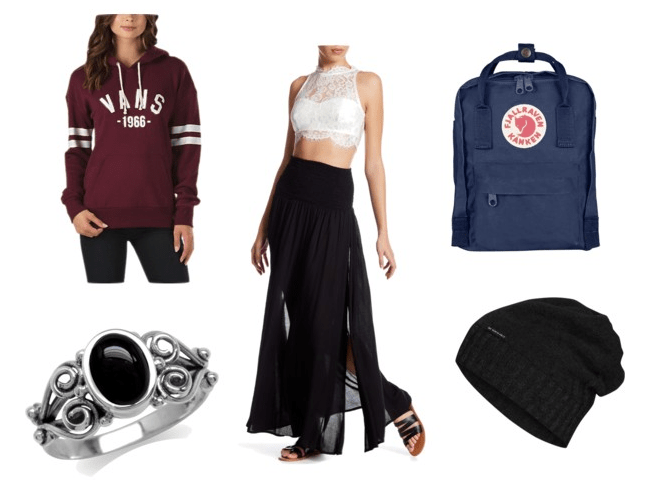 It channels Cara’s laid back style with its sweatshirt, beanie, and backpack, and Jen with its long, glam skirt and pretty ring. You can pair this with cool open-toe ankle boots, or when it gets colder, boots or sneakers with leggings underneath. Either way, you’re sure to look fantastic. What do you think of this crossover? Which look was your favorite? Let us know in the comments below!